I’ve taught a lot of grilling classes over the years—at Barbecue University at the Broadmoor and at venues all over the world. But earlier this year, I led a course based on a very different premise than my usual classes. Sponsored by BUSH’S (of baked bean fame), Barbecue Boot Camp had two simple missions: transform four students from grilling neophytes to live-fire pros, and help them discover their “grilling alter egos” along the way. Grilling alter egos? Do people really have different personalities when they step behind a grill? As it turns out, we don’t all grill the same way or for the same reasons. Some of us are problem solvers—motivated by getting a great meal to the table quickly and easily with everyday ingredients we have on hand. Some of us are adventurers, fascinated with exotic flavors and offbeat grilling techniques. Some of us are aficionados, preoccupied by the pedigree of the ingredients and the overall classiness of the presentation. And a few of us are rebels: we like to upend conventional grilling practices, bringing braggadocio and new thrills to the grill. 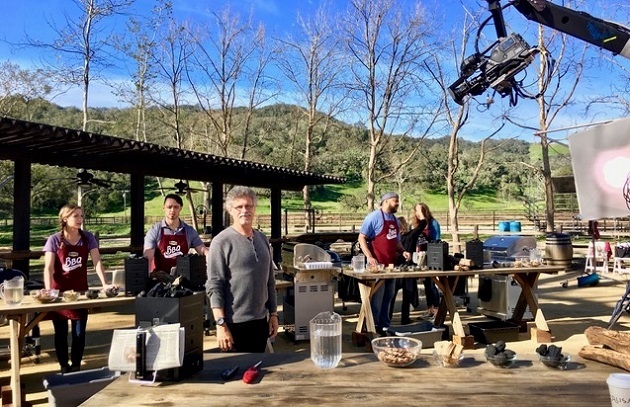 So four students from across the U.S. gathered this past spring at the stunning Alisal Guest Ranch and Resort in Solvang, California, for a class designed to teach them the fundamentals of grilling—and to help them discover their grilling alter egos along the way. Chelsea was our problem solver. A blogger from Salt Lake City, Utah, Chelsea approaches grilling in practical terms: how to get a great meal to the table using common ingredients, grilling on an easy-to-use gas grill. For her I created an inside-out cheeseburger. It calls for straightforward ingredients—ground beef and cheddar cheese—to solve a simple problem: how to cook a burger to a safe internal temperature without drying it out. The solution is as elegant as it is simple: grate the cheese and fold it into the meat rather than placing it on top. That way, you can cook burgers to the safe USDA recommended 160 degrees without drying them out. (The cheese melts, keeping the burger moist even though it’s cooked medium-well.) To accompany the inside-out burger, Chelsea made a grilled corn salsa —again, using ingredients most people have in their refrigerators. OJ was our adventurer. An auto repair shop owner from Naperville, IL, he is naturally drawn to exotic spices and foreign flavors. 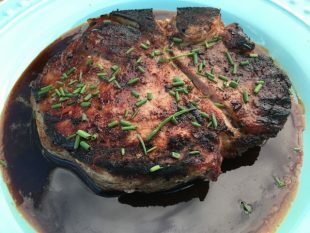 For him, I came up with an Asian-spiced pork porterhouse seasoned with a Chinese five-spice powder rub and a sweet, smoky, hoisin-based Chinatown barbecue sauce. The pork porterhouse is a mammoth chop comprised of two of our favorite cuts of pork—loin and tenderloin—separated by a T-bone. The five- spice powder rub gave it a licoricy sweetness associated with the best Chinese barbecue. Ever the adventurer, OJ chose to cook over charcoal, and with the pork chop, he served another foreign-inspired dish: the grilled version of Mexican chiles rellenos. 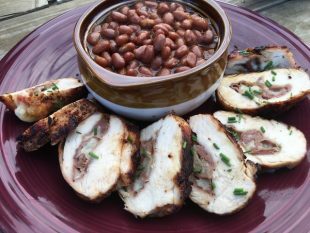 Cumin, jalapenos, and baked beans add blasts of flavor, while grilling slashes the fat found in the traditional batter-fried version of this dish. Randi was our rebel. A yoga teacher from Chicago, Randi likes to think—and grill—outside the box. For her I proposed “caveman strip steaks”, a three-finger-thick steak grilled directly on a bed of red-hot embers. This singular method of grilling produces a smoky crust you just can’t achieve on a conventional grill. 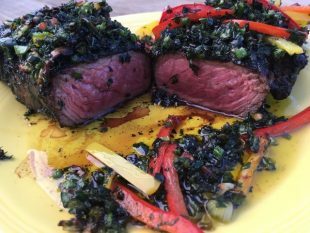 By way of a sauce, Randi cooked a colorful bell pepper panfry—again, directly on the embers—which she spooned over the steak. Randi’s side dish took an equally iconoclastic approach: she turned conventional potato salad on its head by smoking the potatoes. Again, she used a charcoal grill because it’s a lot easier to smoke with charcoal than with gas. Cliff was our aficionado. A construction company owner from Milwaukee, WI, Cliff likes to take familiar foods to new levels by combining sophisticated ingredients with a refined presentation. Cliff upscaled commonplace chicken breasts by stuffing them with manchego cheese and Serrano ham. He continued the Spanish theme by basting the chicken breasts with pimenton garlic butter flavored with Spanish smoked paprika. This solved another problem: the tendency of lean chicken breasts to dry out on the grill. Cliff’s side dish took an equally upscale approach to a familiar vegetable: asparagus. I showed him how to pin the stalks together —Japanese style—into a raft, securing them with toothpicks. A rich-flavored glaze of Asian sesame oil and BUSH’S baked bean juice gave the asparagus a sweet nutty finish. 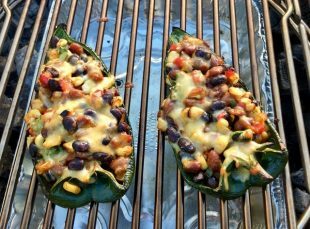 He created these delights on a gas grill. We all learned a lot, having loads of fun in the process, and three hours later, we sat down to a spectacular meal. I must confess that, prior to BUSH’S Barbecue Boot Camp, I hadn’t given much thought to grilling alter egos. The class made me realize that people do grill differently, depending on their philosophy, personality, and individual style. Actually, I think most of us have a bit of all four grilling alter egos in us. As the guy who popularized dishes like caveman steak, grilled pizza, beer can chicken, and grilled desserts, I’m certainly a grilling rebel. But I’m also a grilling adventurer, circumnavigating the globe four times to document barbecuing and grilling in more than 60 countries. I like to think of myself as an aficionado and I’ve grilled my fair share of wagyu steaks, lobster, foie gras, and truffle-stuffed turkeys. But I also love the problem solving of raiding the refrigerator and cooking an entire meal on the grill with what I find—no special shopping trip required. My other takeaway from BUSH’S Barbecue Boot Camp is that you don’t need to be locked into a single grilling alter ego. Chelsea is a problem solver, but she was adventurous enough to try an offbeat grilled corn salsa (a dish she had never made before). Randi used rebel techniques like caveman grilling and smoking, but her steak and potato salad are the stuff of everyday barbecues everywhere. What’s YOUR grilling alter ego? And what can you learn from the others? We’d love to hear from you on the Barbecue Board, Facebook, Twitter, or Instagram. As always, send photos! For Steven’s tips from BBQ Bootcamp, check out Part 1 and Part 2.